The European economic growth appears still fragile, with economies characterized by a large public debt and the expectation on the inflation that has not changed despite the ECB’s market stimulus. The excess of liquidity in the markets has reduced government and corporate yields, leading the insurers to reallocate their portfolios towards more risky markets. Moreover, the high volatility driven by the recent economic and political events has exacerbated the burden of persistent low growth and low yield bore by the insurers, which struggle to match their obligations towards the policyholders while maintaining a sufficient level of profitability. With the aim of identifying the risks and assessing the resilience of the insurance sector as well as a potential systemic impact to the financial and economic environment, EIOPA launched last 24th May 2016 the EU-wide Insurance Stress Test, with reference date 1st January 2016: the outcome, disclosed on the 15th December 2016, raised some concerns, deserving a supervisory response to ensure coordinated actions. The double hit scenario produces the highest loss, nonetheless it represents a plausible but very extreme event, whose results are not spread equally across the sample (i.e. there are a number of conditions and portfolio structures that make undertakings more vulnerable to such an event). The severity of the scenario goes beyond the SII capital requirements, although its likely-hood cannot be fully calculated. The results of the Low for long scenario, instead, are more relevant and challenging given the debate on the future course of interest rates. The impacts of such a scenario are spread over a number of years, which may well exceed the decade. Rather than being interpreted as a pass/fail exercise on the capital requirements, the ST2016 was designed as a vulnerability analysis, testing extreme albeit plausible scenarios. 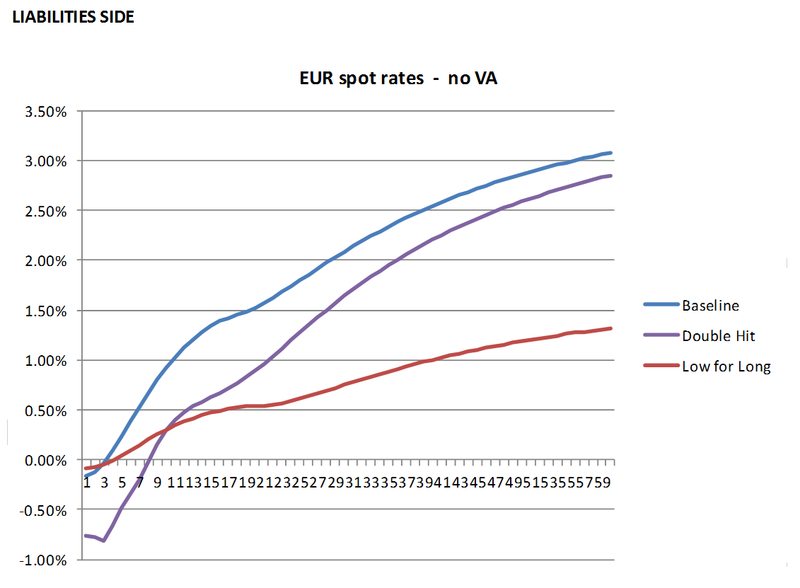 For this reason, there are some departures from the strict application of the Solvency II regime: for instance, the spread shocks were applied to the EU sovereign bonds and in the Low for Long scenario a different assumption for the UFR was used (reduced to 2% – please note that there is no link between this hypothesis and the ongoing consultation on the methodology to derive the Ultimate Forward Rate). With this aim in mind, the SCR was not recalculated under the stresses, on the contrary changes in Assets, Liabilities and Excess of Assets over Liabilities (AoL) were measured to allow a comparison between pre and post stress situations. The companies in the sample hold almost 6300 billion in total assets (around 60% of the total assets held by insurers) and show a good capitalization in the Baseline, with an overall SCR of 196% and AoL ratios >1 for all the undertakings. Even if the companies keep on showing a positive Excess of Assets over Liabilities after the stresses (the ratio goes below 1 for 2% and 1% of the sample in the DH and LfL scenarios), the stressed situations decrease this cushion of a quarter and the share of companies that lose more than a third of Excess is remarkable (44% and 16%). The LTG and transitional measures, among which the VA is by far the most widely used (64% of undertakings), play a crucial role in both the Baseline and the stressed scenarios. The overall SCR-Ratio in the Baseline falls from 196% to 136% in absence of these measures, which also help in keeping the AoL ratio >1 in the DH scenario; the importance is instead less pronounced in the Low for Long scenario. This confirms the intentions behind the VA, which was designed to allow the insurance companies to continue to operate under the assumption that rapid, large and unexpected changes in market asset values are of temporary measure, while was not meant to support the insurance sector in a scenario with long term challenges such as low interest rates. If the LTG and transitional measures were not applied, insurers would probably be induced to force sales and de-risking in order lowering their SCR, possibly pushing further down asset prices, adding to the market volatility and potentially affecting financial stability. Nevertheless, the qualitative questionnaire included in the exercise indicates that insurers do not foresee the need for large scale assets sales: half of participants declared their intention to increase holdings in assets mostly hit by the adverse scenario, potentially acting in a counter-cyclical manner. 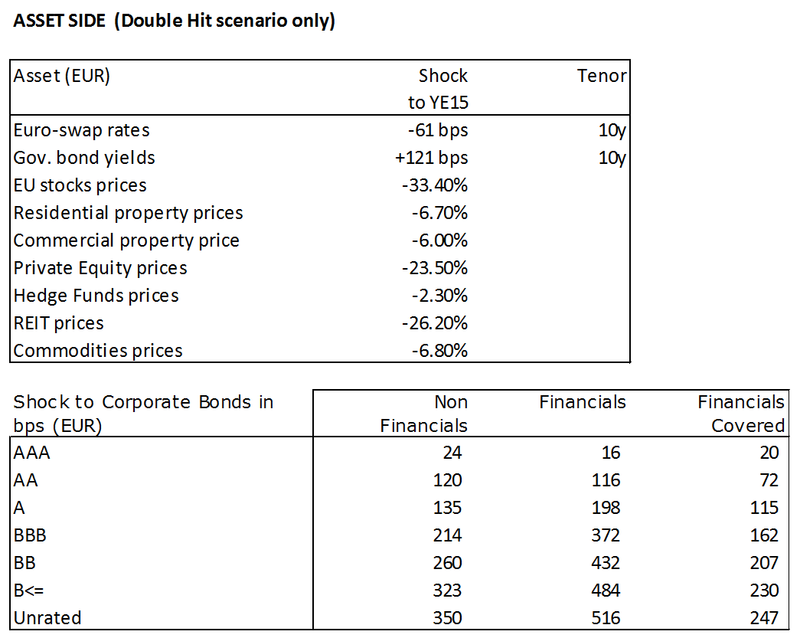 In the Double Hit scenario the values of both Assets and Liabilities decrease: the latter is explained partially by the fact that a shock in the asset values implies a reduction of the future benefit payments and profit participations and partially by the increase of the discount factors, given by an overcompensation of the VA (increased due to the high spreads) on the reduced swap rates. In the Low for Long scenario both Assets and Liabilities increase, with the Liabilities increasing more because of their longer durations (the higher the durations, the higher the vulnerability). The results show that companies with higher AoL ratios are generally more vulnerable, as well as companies with a high SCR, this is particularly the case for smaller undertakings. On the other side, large companies, despite not being the most affected by the stresses, are still potentially vulnerable, exhibiting low AoL ratios in both baseline and stressed scenarios. Companies with a large share of unit linked business are less impacted than those with a large share of traditional business, but, although the unit linked business may act as a shield, it can introduce other risks not included in the stress test: is a competitive market, where liquidity issues could also arise if a large number of policyholders were to surrender at the same time. The exercise was carried out on a sample of 236 solo undertakings from 30 countries, which have been selected as perceived more vulnerable to the current market risks, given their long term life business characterized by interest rate guarantees. Solo undertakings were preferred to groups to highlight potential issues: individual subsidiaries may find support from well diversified groups at a consolidated basis. The sample is dominated by four countries (FR, UK, DE and IT) that represent together almost ¾ of the total. Overall, market coverage of 77% was achieved. The sample undertakings are adequately capitalized, with an overall surplus (EOF-SCR) of 280 billion. 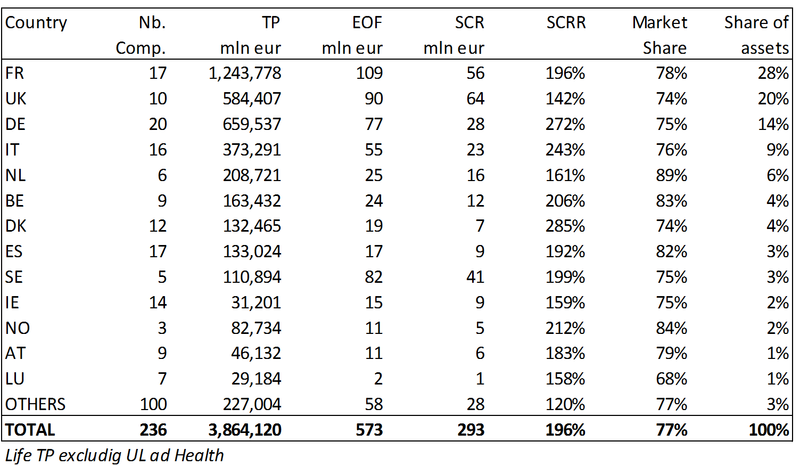 81% of the companies are SF users, showing a market risk that accounts for 64% of the net SCR before diversification. Bonds account for the biggest share of assets (47%): half are governments, half are corporates. Regarding the sovereign, there is a degree of bias in holding those of the country the undertakings belong to: 50% of the exposures of sovereigns is concentrated in FR (27%) and IT (23%), the percentage reaches 89% including DE (11%), ES (10%), BE (9%) and UK (7%). Regarding the Corporates, 60% of bonds are held in AAA to A buckets, with a 25% concentration in BBB. The Technical Provisions account for more than 90% of the total Liabilities, proving that insurers do not rely on external market financing and the financial leverage is small compared to the overall TP. 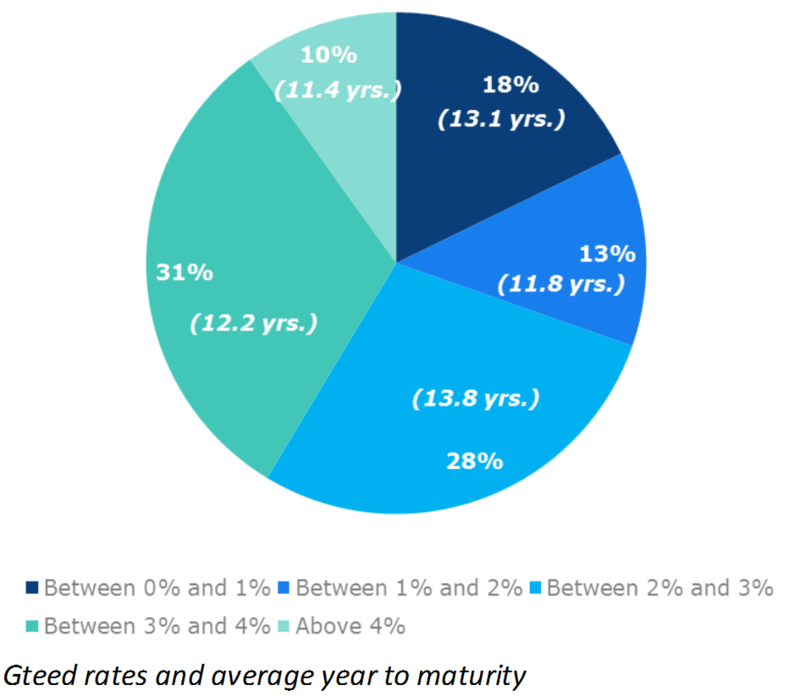 The guaranteed rates are high compared to the current interest rate levels and will apply to future premiums as well, with an average year to maturity above 12 years. The results of the exercise exhibit the importance of the diversification tool, as well as the projection methodologies, in particular the ability to model negative interest rates, the reliability of the economic scenario generators and the credibility of the future management actions used for all the simulations. The exercise confirmed the vulnerability of the insurance sector to the low interest rate environment and to a pronounced reassessment of risk premia. For this reason EIOPA decided to issue a set of general recommendations addressing the need for follow-up actions: National Competent Authorities (NCAs) are requested to assess whether the vulnerabilities identified pose a threat to the viability of the entities and of the entire system, EIOPA will undertake a coordinating role.